The teachers enjoyed their second (half day) of training and we had a meeting with the leadership at the school to learn how we could build on this new relationship. While visiting this school, we realized that if we really want to make a difference in education for children we have to provide consistent, quality training for the teachers. Just providing resources is not enough. This is especially important when you realize that most kindergarten teachers have only a grade 8 education or less. 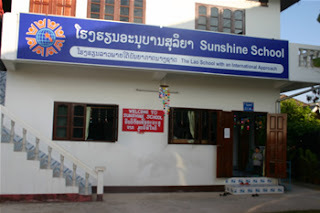 So the current plan is to send all 4 teachers back to Vientiane for one full week of training (they will live, eat and teach at the Sunshine School alongside the regular teachers) in July when their school shuts down for a week. Then we’ll have teachers from the Sunshine School come down to visit the kindergarten here in Muang Khong to provide support and see how they’re doing. So essentially we’re creating a partnership between one of Vientiane’s most progressive schools (many of the city’s elite send their children there) with our school, which, as you know, serves mostly poor children with little hope for higher education (as it stands right now—hopefully we can change that). After this, we would like to turn the Muang Khong school into a model kindergarten school for surrounding villages to come to learn from them. Very exciting stuff! We drove south in a rented van, arriving after dark at the ferry station. The driver didn’t want to come over on the ferry as he had to go to Pakse, so we bundled all of our supplies, plus the teachers and ourselves, into a longboat, crossing the Mekong River with nothing but starlight to guide us. It was a bit like a scene from a movie, but we were happy to be dropped off right in front of our guesthouse (though we did have to carry the supplies up a steep riverbank). Welcome to the island of Muang Khong! 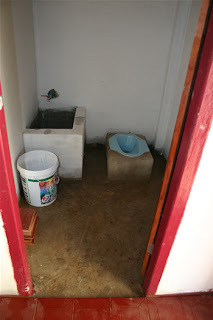 The next morning we had our first look at the washroom facility we built. 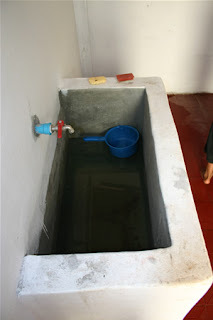 We were impressed with the utility and workmanship—it’s right next to the kindergarten and has a huge wash basin where teachers can help wash the smaller children, and both toilets have water taps where children can wash their hands. Most importantly the children are using it, and they love it! So they should be much healthier now. Also, the children were moved into a new 2-room cement block school as the old school (a wood shack) was taken over by a nearby primary school. This school was built through the government by an NGO, but it was never finished as the money ran out (a common problem in developing countries, which is why we are handling the contract work ourselves). For this reason we are paying for paint for the outside walls and floor mats (the floors are dusty, uneven cement—bad for small children). Also, we’re building a fence around the school to keep the children safely inside (they sometimes try to go home on their own, and primary school students come to tease them) and to keep the water buffalo out (so we can build a garden to create a food program and plant some fruit trees). We also need to build some cement steps since the previous builders didn’t get that far, and fix the locks on the school. So there’s still a lot to do, but it was great to see all the alphabet posters go up on the walls (in both English and Lao) and various other things in the classroom, such as the new chalk board, folding tables and stackable chairs (which they chose over wood due to a lack of space), and other educational items. It actually looks like a place of learning now! The principal organized a small ceremony formally recognizing Jai Dee Children’s Fund’s contribution to the kindergarten school. 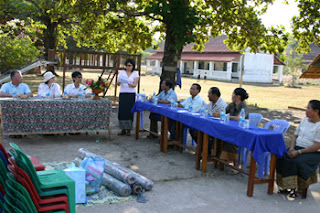 Jai Dee also presented the school supplies brought from Canada and purchased in Laos. Four officials attended and delivered speeches of gratitude. Also our third director, Greg Mackenzie, arrived in time to attend the event, so all our directors were there! The children charmed us with three adorable performances of Lao dancing (with a few modern moves thrown in) and had a great time eating the local cakes and cookies we provided. It was truly a magic day for all. Today we went to visit one student’s house. Her name in New-ning and she is around 5 years old (her parents don't have a birth certificate and birthdays aren't celebrated here so no one is sure exactly how old she is). She lives in an open bamboo shack, with her parents and seven brothers and sisters (the eldest is 21, and the youngest are twins, aged three months). It was heartbreaking to see the twins in small homemade hammocks, with no running water for bathing and no actual walls to protect them from the elements. The mother is 36, my age. She talked about how hard it is to feed her children (her husband works odd jobs for a dollar or two per day, when he can find work). While rocking her babies to sleep in their hammocks she looked out through the gaps in her bamboo walls. “I will fight on,” she said, shaking her head, as though wondering exactly how she would manage. We gave her some (of our own) money to meet the baby’s needs, but the only thing that can really help is if their children can get an education—then they can support their parents as well as themselves. Tomorrow we will go back to film a video of a day in this student’s life so we can share it with all of you, and you can feel what inspires us to work so hard for these children. 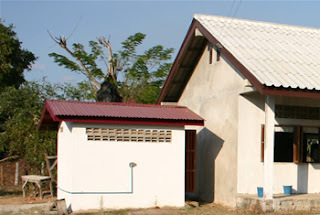 Right now we're in Pakse, where we finally have real internet access (it's impossible to post on the blog in Muang Khong as the server is too slow). We were supposed to meet with a local charity that works with schools but the timing didn't work out for them (they're in the field). So hopefully another day. We also changed some money to pay for the new fence for the school, which we hope to have up before we leave. On a more casual note, it's hot, hot, hot here!! Really hot. Hard to believe that it actually gets hotter in another month. But guess we can't complain since it's about -20 in our hometown of Toronto, Canada. That's all the news for now!